This is the her dhal that I raved about in my previous post. It’s not just that I’ve never met a red lentil dish I didn’t like. It’s not that I’m being subjective here. Oh no! This is really and truly delicious! I love the double dose of cumin in the tarka, seeds and powder, the scent of turmeric, and the lusciousness of the tomato and onion sauce. I love how well it goes with the lentils, and oh the simplicity of it all! It doesn’t take too long to cook, either. Red lentils take about 30 – 35 min (OK, longer if they’re older! like any lentils really), and during that time, you can prep and cook the tarka. I stuck pretty much to Andrea’s recipe, making minor changes: using ghee instead of oil and black instead of yellow mustard seeds. I also changed the cooking method slightly, in that I cooked my onions until golden, and my tarka for a bit longer, because this is the way a Punjabi friend taught me. 1. Rinse the lentils a few times, until the rinsing water runs clear. 2. 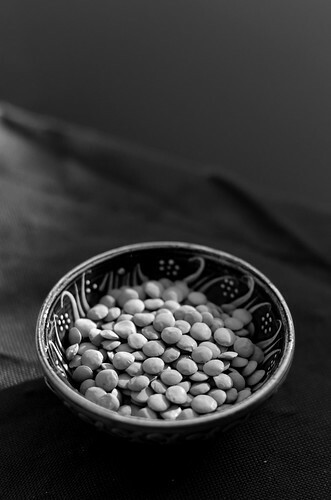 Transfer the lentils in a thick-bottomed pan, add the water and cookon medium to high heat until boiling. 3. Skim off the foam that gathers on top as the lentils start boiling, and then lower the heat and continue cooking until the lentils soften. Stir occasionally. 4. While the lentils are cooking, start making the tarka. Chop the onions, tomatoes, and chillies (removing the seeds if you prefer less heat). I like a bit of texture in my dhal, so I simply sliced the chillies into rounds, and chopped the onions not too finely. 5. Heat the oil on medium to high heat in a small pan, and when bubbling, add the cumin and mustard seeds. When the cumin becomes fragrant, and the mustard seeds start popping, add the onion and chillies, and cook until the onions become golden. 7. In go the tomatoes! Cook, stirring occasionally, until the mixture gets glossy, which is a sign that the oil is starting to separate, and that your tarka is done! This will take about 10 minutes or more, depending on how watery your tomatoes are. You can, of course, cook it for less, but it tastes better, richer, this way. 8. Add you tarka into the lentils and stir through. It’s often nice to reserve a bit of tarka and use it as a topping when serving the dhal. Put in a pinch of salt or two, to taste. I like my dhal thick, but if you don’t add a bit more water. Likewise, if you find it too watery, simply boil the lentils for a bit longer with a lid of. I guess it’s better if you keep an eye on the lentils as they’re cooking, rather than having to do this at the end. I should have told you that earlier, sorry! Serve with rice or bread (chappati, naan, or any bread really), or as a part of an Indian (or other) meal. Enjoy! I’m submitting this post to the February MLLA (My Legume Love Affair), hosted by Rachel, the Crispy Cook. The event was started by legume-loving Susan, The Well Seasoned Cook. When I first started blogging, I didn’t know many blogs from former Yugoslavia. Now there are loads! FBI Rukavice stands for Food Blog Inspection, and ‘Rukavice’ (meaning ‘gloves’) is anagram of ‘kuvarice’ (or ‘cooks’). The event was started by mamajac, and it does exactly what it says ‘on the tin’ – it inspects, or investigates, one food blog a month! This month, Andrea’s beautiful blog Voće i povrće (or ‘Fruit and veg’) is under inspection! I had to take part! Andrea writes in Croatian, and I love her blog because of her recipes, photos and especially her writing. We share love of Indian cooking, so it was natural that I choose her Tarka Dhal as a first thing to try. I say first thing, as I’ve bookmarked many more! I’m going away for work and have to get up at 6 am tomorrow, so for now, here’s just the pic, and I’ll post the recipe in a few days in English. Here is a really special Indian dish that I wanted to share with you in a long time. I’m sharing it now, to celebrate my return! It’s like a kind of Indian-style rendang: moist morsels of lamb coated in thick meaty sauce and coconut. It is deeeelicious! So flavoursome, and such fun to eat. I love the lamb pieces wrapped in roti, or with some other nice bread. In any case, you’ve got to eat this with your hands! This curry is based on a recipe by Anjum Anand from her Indian Food Made Easy BBC series. I changed (upped) the spicing to suit my tastes, and added a South-Indian touch with curry leaves, dried red chillies and mustard seeds. Basically, the lamb is cooked with spices until the meat is tender, and the sauce is well reduced. Then, you sprinkle toasted grated coconut in (fresh or desiccated), and coat the lamb. Yes, it takes time to cook it, but it requires little attention, and it’s really worth it. The first time I made it, I totally forgot about it and spent 2 hours on the phone to a friend, but miraculously, it didn’t burn, and it didn’t harm it all. Next time I was more careful, but it was equally good. Our camera issues haven’t been resolved yet, so no pics this time, sorry. We’re in a long and slow process of choosing a new camera. Possibly, hopefully, a DSLR! I. Toast the desiccated coconut in a non-stick pan until a little past golden, and set a side. This will take a minute or two, so watch it! II. 1. Heat the oil in a wide pan (I love to use my wide and shallow Le Creuset pan, but any thick-bottomed pan will do, with good non-stick properties if possible.). You’ll know it’s hot enough when you put a spoon in it and it starts sizzling. Then add the dried chilies, mustard seeds and curry leaves. When the mustard seeds start to pop, put the lid on. When they stop, add the onions and cook them until they start going golden. Next, add the ginger and garlic, and then cook the mixture until onions are well browned. 2. Now add the chilli powder and turmeric. Stir, and add the tomatoes and salt. Cook this until the oil starts oozing out, separating from the tomato and onion mixture, glossy and beautiful. 3. Now you’re ready to add the meat. Brown the meat in the pan with the onion mixture for a few minutes, add water, and bring to boil. Then cover and simmer on a low heat for about 50 min, or until the lamb is tender. I love to cook it even longer, until it’s melt-in-the-mouth soft. Check the lamb occasionally and add more water if it starts sticking to the bottom of the pan. Once the lamb is done, uncover and continue cooking, stirring often, until any excess water has evaporated. 4. When there is only a bit of liquid left coating the lamb, sprinkle in the garam masala, check the seasoning, and then stir in the coconut. Serve with roti or some other nice bread, with a few veg side dishes if you want. Enjoy every morsel! And let me know how you got on. About two years ago, or perhaps a bit less, when I first started cooking Indian food, a very kind and generous British lady of Punjabi origin invited me to her home for what she jokingly called ‘a curry lesson’. I watched wide-eyed and scared. In awe of all the spice jars and containers dancing in front of my very own eyes. At a time, I knew and recognised a lot of them and had them in my own kitchen, but had precious little clue on what to do with them, if truth be told. That day was a turning point in my cooking in general for several reasons. The first, and perhaps the most important lesson, was to relax. Before, I was confused with all these spices, and scared I’m doing things wrongly. Watching her cook was amazing. She was instinctive, creative, spontaneous. 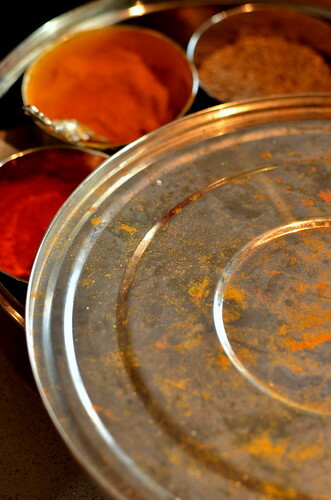 ‘Shall we add a bit of this?… And what do you think that will taste?… I think I’ll do this….’ I relaxed in my mind, and in my attitude towards Indian food; I wasn’t ‘scared’ anymore and started trying things out. This is when the second lesson kicked in: trying things out, and getting to know my ingredients. See how it goes, and learn. Smell and taste. Learn which flavours go together, experiment. Watch what is happening at every stage. Feel and touch. Get involved with your food. See what it feels like at each stage. (Of course, this works with certain foods only.) I truly learnt only by trying and following my instincts. And then remembering and/or writing down what I’d done. And than doing it again. If you recognise yourself in any of the above, maybe I could help you see that cooking Indian food doesn’t have to be daunting and complicated. 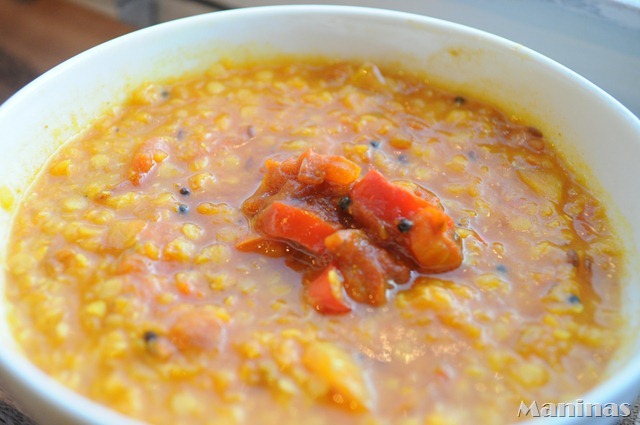 Let’s have a look at this very simple Punjabi dhal. Simple in flavour, and simple in technique, but uncompromisingly delicious. 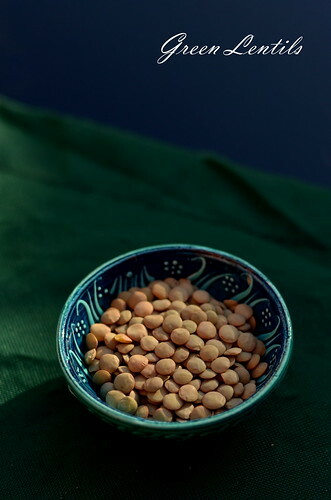 Green lentils are simply cooked with turmeric, and then seasoned with a tarka of cumin seeds,fried onions (until brown), ginger and garlic, and then finished off with some garam masala. I adapted this recipe from Vicky Bhogal’s book ‘Cooking Like Mummyji’. I added a teaspoon of cumin seed at the beginning of the onion tadka, upped the chilli and garlic, and reduced the amount of garam masala. The latter is up to you and your tastes, but for me the cumin makes all the difference, and I urge you to try it. I really love the warming aroma of cumin seeds popped in ghee or oil in this dhal. At a pinch, you can use ground cumin if you don’t have cumin seeds, but please add it after the onions are browned (and not at the beginning, before the onions, because it will burn). The flavour is slightly different, but it will add the important cumin note to the dish. Another change, a little unorthodox for Punjabi cooking perhaps, is that I added a pinch of sugar to the cooked lentils, like they do in Bengal. I find that the sugar round off the flavours really nicely, and mellows the dish. Vicky calls the recipe ‘whole lentils cooked in a pressure cooker’. I didn’t cook them like that, so that doesn’t apply to me. Plus I find this title a bit too generic, so I’m changing the name to ‘Punjabi green lentils with deep brown onions and garam masala’. I’ve made this dish a few times, and it’s always been a hit with Someone I Know And Love. It goes really well with a dollop of yoghurt, some kale aloo, and chapatti. 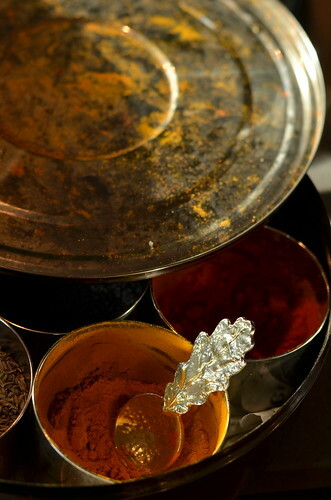 I have just made Anita’s garam masala, and can’t wait to cook this dhal again with it! Someone I Know And Love has gone off for two weeks and taken our camera with him. No photos, but I will try to get a friend to exchange her photographic skills for some nosh. This post is going to the wonderful Lisa for the event No Croutons Required. This month, we’re focusing on Indian soups and salads. Right up my street! I can’t wait to see the round-up. 3. Pour the onion mixture into the dhal and stir through, leaving some tarka on top. Now add the garam masala. 4. Garnish with coriander if using, and serve with some chapattis or rice.